Randy Atwood has two pieces of news to share. 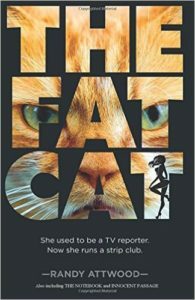 His newest release, The Fat Cat: A Noir Mystery, was recently published in paperback and ebook form. It is available as a paperback at Amazon and as Kindle ebook. In addition, Randy shares that his sales of his novella “The Saltness of Time” have put it into the top 100 of its subcategory in the Kindle Store. This entry was posted in Blog and tagged Amazon and Kindle books, KWA news, Member news, mystery. Bookmark the permalink.